I had some caramelized onions and gruyere left over from this weekend, and it was time to either use them or throw them away. Of course, I had to use them -- are you kidding? Apples and caramelized onions make a great addition to grilled cheese. The only problem is I didn't have any bread. Well, I did. I had one baguette Jason made over the weekend (yum), but it was still defrosting and we wanted a little snack before dinner since we were hungry. Luckily, I did have an apple. 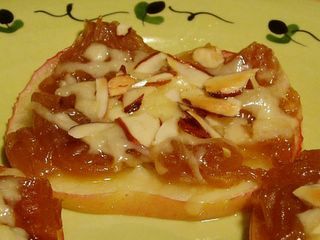 I sliced it thin, topped it with onions and grated cheese and sprinkled with a few almonds for a little crunch. I placed my little apple piles on foil and broiled until the cheese melted, then finished in the oven for 5 minutes. Not bad. Not bad at all.